Oriental and European fire-bellied toads (Bombina orientalis and Bombina bombina) live in a variety of habitats in or near water bodies such as streams, springs, lakes, ponds, swamps, ditches and puddles. 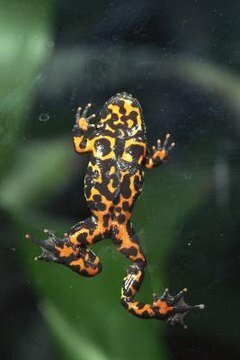 Oriental fire-bellied toads are found in northeast China, Korea, southern Japan and parts of Russia, and the Europeans found in central and eastern Europe. During April and May, fire-bellied toads come out of hibernation and embark on long seasons of courtship and mating. For fire-bellied toads, courtship and breeding commences in May as the weather gets warmer and continues throughout the summer until around mid-August. Most of the eggs will hatch in June and July. This long reproductive season is due to different females depositing eggs at different times. They'll deposit eggs three to 45 eggs at a time, every seven to 10 days. Oriental fire-bellied toads deposit 35 to 260 eggs, European toads 80 to 300. Fire-bellied males of both species court the females by calling to them. The male toads, while floating on the surface of shallow water, produce soft, musical mating calls, sometimes described as barks that last about 12 seconds. They call continuously, throughout the day and night, waiting for females to approach them. As many as 10 males may be available for every female fire-bellied toad at breeding sites, and this fact contributes to complications. Sometimes, when males leap onto passing toads they end up on the backs of other males.The targeted males let out a loud release call and vibrate their bodies to indicate there's been a mistake. Meanwhile, non-receptive female toads in the grasp of amorous males may produce vibrations as signals to release them, too. The mating embrace used by oriental and European fire-bellied toads is know as pelvic amplexus: Males, with their forelimbs, grasp the females' bodies just in front of their hind limbs. During the breeding season, the male toads develop dark, rough nuptial pads on their first and second fingers and their forearms to help them keep a secure grip on the females. The females swim around depositing their eggs, the males on their backs fertilizing the eggs as they are laid. They secure the eggs singly, in small clusters or larger clumps to submerged plant stems, grasses and rocks. With no further interaction with their parents, the eggs hatch after three to 10 days. Tadpoles start to metamorphose at 10 to 14 weeks. At about 5 months old the fire-bellied toads are adults, but they won't be sexually mature until they're 2 to 4 years old.